↑ "شيحة: مكاتب الصحة وثقت سقوط 840 شهيداً خلال ثورة 25 يناير". Almasry-alyoum.com. 16 March 2011. สืบค้นเมื่อ 4 April 2011. ↑ "Egypt: Cairo's Tahrir Square fills with protesters". BBC. 8 July 2011. สืบค้นเมื่อ 11 July 2011. ↑ "Q&A: What's Behind the Unrest?". SBS. 27 January 2011. สืบค้นเมื่อ 29 January 2011. ↑ "Estimated 2 Million People Protest In _ Around Tahrir Square In Cairo Egypt.mp4 | Current News World Web Source for News and Information". Cnewsworld.com. สืบค้นเมื่อ 20 February 2011. ↑ Siddique, Haroon; Owen, Paul; Gabbatt, Adam (25 January 2011). 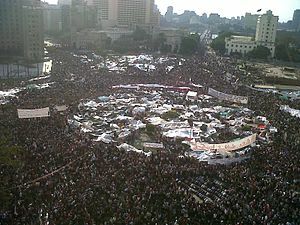 "Protests in Egypt and unrest in Middle East – as it happened". The Guardian. UK. สืบค้นเมื่อ 26 January 2011. ↑ Fleishman, Jeffrey and Edmund Sanders (Los Angeles Times) (29 January 2011). "Unease in Egypt as police replaced by army, neighbors band against looters". The Seattle Times. สืบค้นเมื่อ 1 February 2011. ↑ "Looting spreads in Egyptian cities". Al Jazeera English. 29 January 2011. สืบค้นเมื่อ 1 February 2011. ↑ Hauslohner, Abigail (29 January 2011). "The Army's OK with the Protesters, for now". Time.com. สืบค้นเมื่อ 1 February 2011. ↑ "Mubarak plays last card, the army; Police vanish". World Tribune (online). 31 January 2011. สืบค้นเมื่อ 1 February 2011. ↑ Stirewalt, Chris (31 January 2011). "Egypt: From Police State to Military Rule". Fox News. สืบค้นเมื่อ 1 February 2011. ↑ "Regional Reaction Mixed For Egypt Protests". Eurasia Review. สืบค้นเมื่อ 19 February 2011. ↑ "Travel warning issued, evacuation to start as protests continue in Egypt". English People's Daily Online. 31 January 2011. สืบค้นเมื่อ 19 February 2011. ↑ Shadid, Anthony; Kirkpatrick, David D. (30 January 2011). "Opposition Rallies to ElBaradei as Military Reinforces in Cairo". The New York Times. สืบค้นเมื่อ 31 January 2011. ↑ "Mubarak to be tried for murder of protesters". Reuters. 24 May 2011. สืบค้นเมื่อ 24 May 2011. ↑ el-Malawani, Hania (13 February 2011). "Egypt's military dismantles Mubarak regime". The Sydney Morning Herald. ↑ "Egypt's prime minsiter quits, new govt soon-army". Forexyard.com. สืบค้นเมื่อ 5 March 2011. หน้านี้แก้ไขล่าสุดเมื่อวันที่ 29 พฤศจิกายน 2561 เวลา 13:20 น.